If you ask my husband, I am always buying sunglasses. But honestly, I don't. Okay, maybe once or twice a year I get new sunglasses. Why? Because they get all beat up and scratched or chopped in half by my children. Just the normal stuff. So this time, I said enough is enough!! I need a sunglass case. One that will not get beat up in my purse. Once where they can "slide out". One that closes and fits ginormous glasses into. Cut your pieces and then iron the interfacing to the wrong side of both of your fabric pieces. Fold the bottom edge of your fabric up 3 1/2" and pin it in place. Stitch it down. 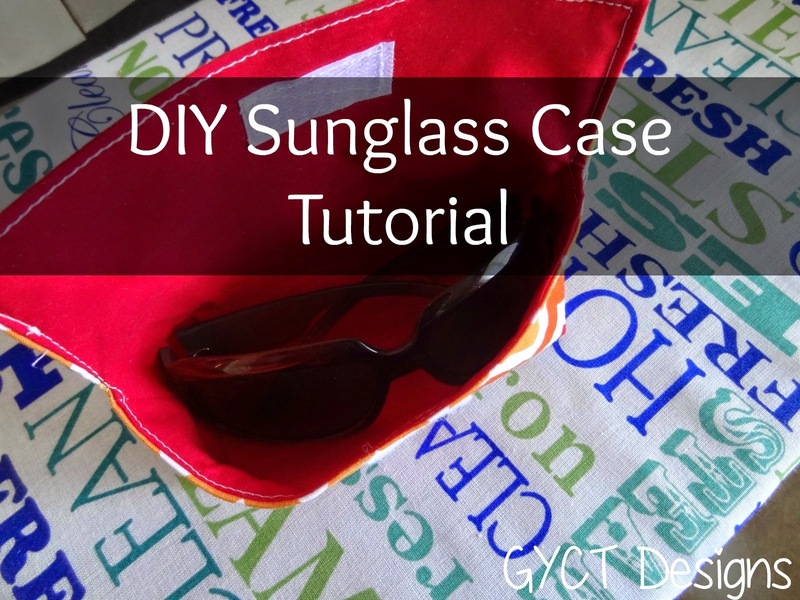 Next take the bottom edges of your case and fold them to make a diamond shape. Measure from the edge 1 inch and stitch across (like the picture above). The finished pieces should look like this. Place the two pieces right sides together so they fit inside of one another. Pin in place and stitch around the edge. Make sure to leave a 2" open so that you can flip it right side out later. Topstitch around the entire case. Finishes it nicely but also keeps the lining from coming out. Next, place your Velcro and stitch it in place. You're all done!! See, so much roomier and no scratching! Closes nicely. Doesn't take up loads of room. Helps prevent scratches. Now my husband has nothing to complain about. Perhaps I should get some new sunglasses just to mark the occasion.